This entry was tagged Dido and Simon, Dido Twite & Joan Aiken, Joan Aiken's last words, Terry Pratchet's last book, The Witch of Clatteringshaws Afterword. Bookmark the permalink. 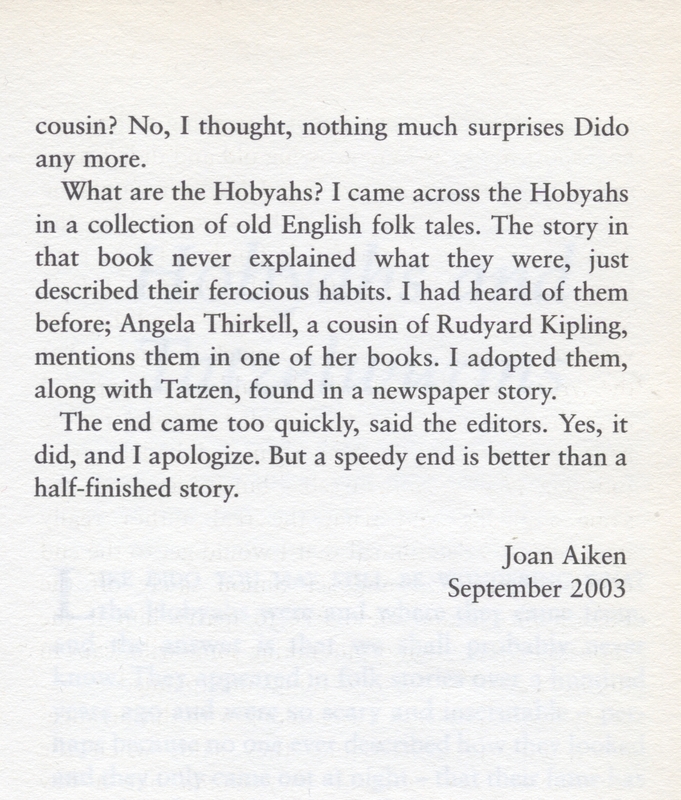 It is so cheering and touching to see how much Joan Aiken cared for her characters. Dido and Simon and Is and Penny, and Dido’s awful father with his music that made him almost redeemable. And all the rest. I have loved them for longer than I can remember. I met J A twice; I was lucky and I knew it. The last time was December 2002. I remember how much she looked like a character from one of her books, and how she was brimming with stories- that day about her brother and her trips to Downing Street during the second World War. Lizzie, forgive me if this is a cheek, but do you ever think of writing a biography? I guess this is as close as I have got so far – she’s a hard act to follow, and quite a private person, plus which I’m still hard at it keeping up with the reprints! But thank you. I remember the bittersweet feeling when I came to this last slim volume. But the usual trademark aspects were some consolation — the inventiveness, the anachronistic puns (coach park anyone?) and the humanity; and above all the fact that although the saga had come to an end Dido, and her creator, would continue to live on in our hearts and minds. And of course there are the re-reads to look forward to as well! When I first read it in typescript staying overnight with her down at Petworth I found it terribly dark, and was rather taken aback, but I have come to know and love it in all its hilarious detail, and now find it strangely comforting. I agree,you do have to know her writing well to pick up on the puns and get the full pleasure of the experience! Drat these incomplete American editions of JA’s books, but thank you, Lizza, for these updates and addenda. BTW, was JA left-handed? Because it seems that Malise is — or at least ambidextrous. No, not for writing anyway, but she did everything else with both hands! Lizza, thank you for posting this! 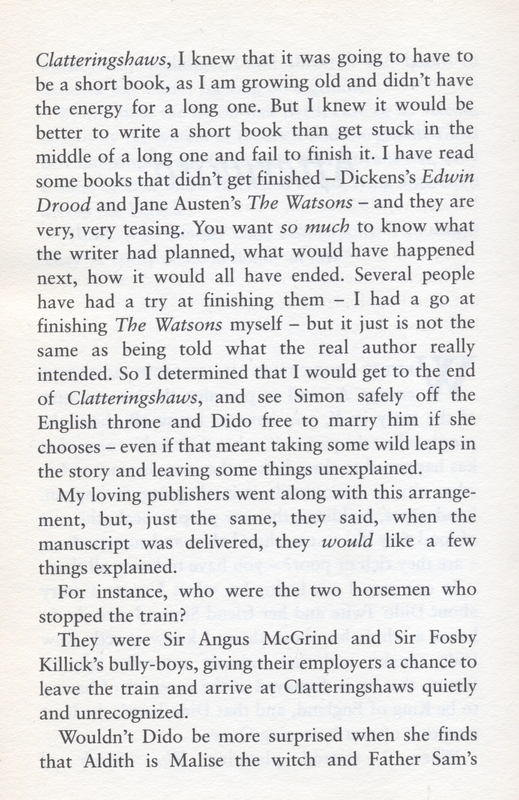 It says a lot about Joan Aiken’s writing that so many of us, including my 11-year-old daughter and me, have come to care so much about these characters, especially our heroes Dido and Simon. And even at the end of the series, here she is taking care to give us hope for their unwritten future. I love that she really had her readers in mind through all of these books, which after all is why Dido survived the end of Black Hearts in Battersea. Joan Aiken was so prolific and wrote so much, as we are discovering as our family is now reading through the Armitage Family and Arabel stories. 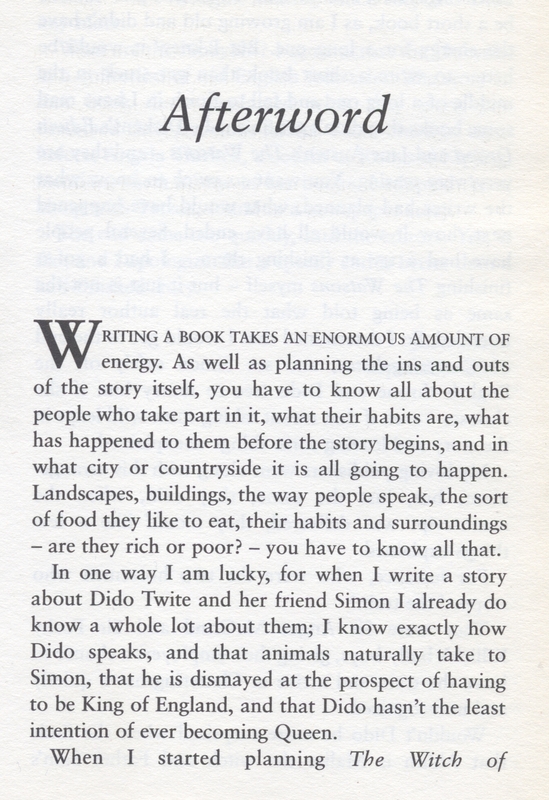 Having just finished the Wolves Chronicles, though, I’m inclined to feel that this sequence of books was her “magnum opus,” but is there any evidence that Joan Aiken felt the same, that this world she was creating was perhaps larger than the sum of the stories that took place in it? I don’t imagine she had nearly the same obsessive compulsion to document and date every last detail of Dido’s world like Tolkien did for his Hobbits, but it would be so fun to learn more about how that world was shaped over the course of a half century! 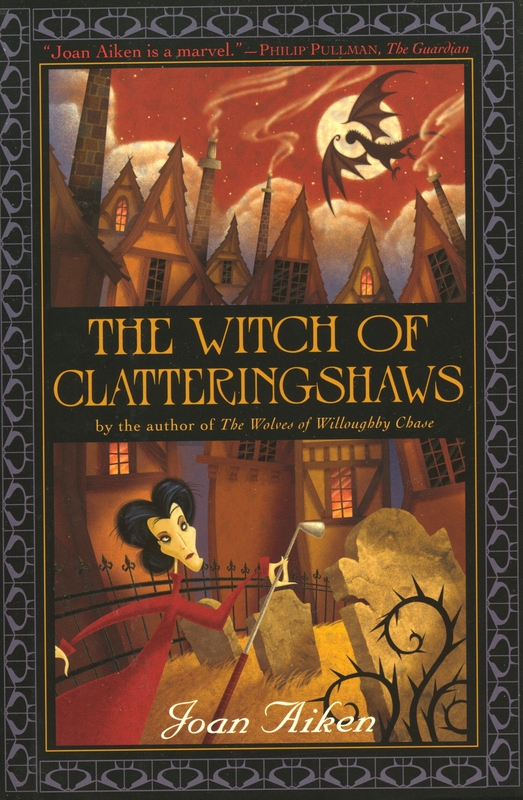 Joan inhabited many different worlds – for instance Rumbury Town where Arabel and Mortimer live also appears in some of her other stories and in fact was so real to her that she defended it to the hilt in a letter to an American Editor in this piece you may enjoy!